Scientists at the Imperial College London have shown that the efficiency of solar panel designs can be improved by up to 22 percent by covering their surface with aluminum studs. In new research, scientists have demonstrated that the efficiency of all solar panel designs could be improved by up to 22 percent by covering their surface with aluminum studs that bend and trap light inside the absorbing layer. Dr Hylton and his colleagues attached rows of aluminum cylinders just 100 nanometers across to the top of the solar panel, where they interact with passing light, causing individual light rays to change course. More energy is extracted from the light as the rays become effectively trapped inside the solar panel and travel for longer distances through its absorbing layer. 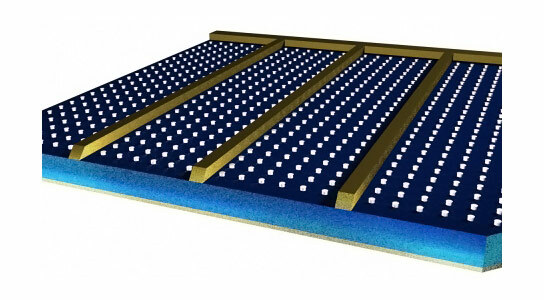 Be the first to comment on "Aluminum Studs Improve Solar Panel Efficiency"